Fire doors are available in many different types of materials including wood, steel, fiberglass, and commercial products. Casco can source 20, 45, 60, or 90 Minute ratings with material selection varying in each level of rating required. Let us know what rating is required and what materials are needed and we can identify the best doors for a project. 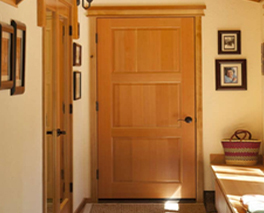 Paneled wood fire doors provide great aesthetics while providing the safety needed for city code requirements. 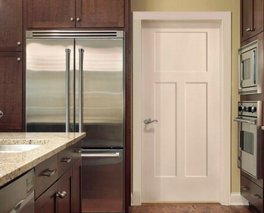 As a standard for most residential fire doors, Masonite steel edge doors provide the value and design for most homes. Steel hollow metal with rated and labeled frame and rated panic devices.